The 'Good News' is I was one of the 700+ people who attended David Icke's presentation at the 'Université du Québec à Montréal' (UQAM), 405 St. Catherine St. E. from 9:00 AM until 6:00 PM on Saturday, October 26th, 2002. This was David Icke's best presentation in Montreal to date. Though he has made various presentations in Montreal in previous years - 1999, 2000 and again in 2001 he has never attracted the numbers that showed up this time. The Marie-Gérin-Lajoie Theatre-Style Hall has a capacity of 733 seats and the event was sold out. There were even people on extra chairs at the back. For the entire 8 hour presentation the audience stayed with David and he taught us well. Bravo David for being one of those who dares to lead the way! David's presentation summarized the material from his previous research in the morning. 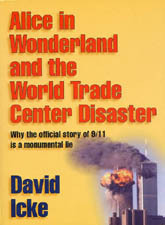 In the afternoon he focused on the information in his new book just released on October 1st, 2002 entitled 'Alice in Wonderland and the World Trade Centre Disaster' and subtitled 'Why the official story of 9/11 is a monumental lie' and on what we-the-people can do to work on solution-oriented missions. Readers are invited to read this information which is posted on the back cover of the book. "Since that horrendous day of September 11th, 2001, the people of the world have been told the Big Lie. The official story of what happened on 9/11 is a fantasy of untruth, manipulation, contradiction and anomaly. David Icke has spent well over a decade uncovering the force that was really behind those attacks and has travelled to 40 countries in pursuit of the truth. he has exposed their personnel, methods, agenda in a series of books and videos. Therefore, when the attacks came, it was easy to recognize the Hidden hand behind the cover story of 'Bin Laden Did It.' Icke takes apart the official version of 9/11 and the 'war on terrorism' and shoes that those responsible are much closer to home than a cave in Afghanistan. He explains why 9/11 was planned and to what end. It is vital to maintaining our freedom, and to the memory of those who died and the loved ones left behind, that the light shines on the lies and deceit behind September 11th. Icke also places these events in their true context as part of an agenda by hidden forces working behind the puppet politicians to create a global fascist state based on total control and surveillance. But it doesn't have to be like this; it does not have to happen. We can change the world from a prison to a paradise and, as Icke explains, the power to do that is within you and with us all." David's new book has 514 pages of information in 16 Chapters - backed up with reputable sources. I invite those who have not yet read any of David Icke's books to start your 're-education' by buying and reading this book and then sharing it with you family, friends, neighbours and working colleagues. Since most book stores are afraid to carry David Icke's books, (wondering why? - see below) you can order your book from The Cyberclass Network which distributes all of David Icke's books. 2. There was also some communication to 'Université du Québec à Montréal' (UQAM) prior to Saturday morning in an effort to persuade the President to cancel the event. The President of 'Université du Québec à Montréal' (UQAM) is to be lauded for not buckling under the pressure of those who would deny 'freedom of speech' in Canada. Readers are invited to go to this website: www.uqam.ca and click on the email icon at the top right corner of the page and send a email of congratulations to the President of 'Université du Québec à Montréal' (UQAM). In you own words simply express your appreciation that you were pleased to have been one of the 700+ persons who was 're-educated' by David Icke on Saturday, October 26th, 2002 in the Marie-Gérin-Lajoie Theatre about 'Why the official story of 9/11 is a monumental lie.' Likewise commend the president for not bowing to those false communications which seek to ban David Icke from speaking in Canada. 3. David Icke was again harassed by Customs and Immigration Officials when he arrived at Dorval Airport on October 24th, 2002. David was stopped and held while his bags were searched - as usual. Nothing was found and they released him to enter this dear country of Canada where we all respect 'freedom of speech' - Don't We? 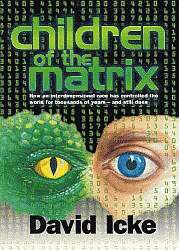 What we-the-Defendants and readers whom I'll identify as we-the-people must do now, is to review this 'Statement of Claim' and determine whether it is valid since David Icke's book, Children of the Matrix is not listed on any banned book list. We-the-Defendants will have to file our Statement of Defense by mid-November 2002 and before that time it must be determine whether we file one joint statement of Claim or whether each of us will have to file an individual Statement of Claim. Readers are invited to network this email far and wide and request professional advice on the optimal method of responding to Richard Warman's 'Statement of Claim.' He may have given we-the-people an opportunity to solidify our support for 'freedom' across Canada and beyond. We are already making a significant impact in bringing light to the world and let's advance our self-imposed mission for spiritual change and growth by taking positive action with this seemingly negative action by Richard Warman - who can be our best teacher. Of course responding to this 'Statement of Claim' will cause we-the-people to incur financial costs. Perhaps someone somewhere will come up with an idea of how to cover the financial costs for legal advice. Please forward your ideas (a) about how to respond and (b) how to cover the financial costs to: tom@cyberclass.net and I will share them with all of the Defendants. That's all the 'Good News' for today!